The Signature Sleep Contour coil mattress is among the most affordable mattresses in its category. It’s also among the most highly rated mattresses online. This suggests that most people find it quite appealing to their needs. However, do know that quality never comes cheap especially with mattresses. But we all know that sometimes quality does come affordable. Could this be the case with the Signature Sleep Contour? Let’s find out in the review below! The Signature Sleep Contour mattress- what is it? What are previous buyers’ views and feedback? Innerspring mattresses have been around since the 1930s. These mattresses’ high staying power emanate from their affordability and excellent compatibility with different sleeping styles. They are also popular for their characteristic bounciness and above average support that may offer some degree of pressure point relief. From a budget standpoint, innerspring mattresses are a good bet for homeowners who are more after an affordable option. Most of these models cost a little over a hundred bucks. In fact, some brands including Ikea have innerspring mattresses that cost way below this mark. You may also want to consider a coil mattress if you get so hot when sleeping. These beds retain less heat thanks to the negative spaces between the springs. In addition, their bounciness and good edge support make them a superb choice for couples. On the flipside, innerspring mattresses have the poorest contourability. Most of them might also be a little bit hard to move on. Thus, I wouldn’t recommend them if you are looking for a bed that will help relieve your back, joint, and neck pains. In that case, a medium-firm memory foam or latex mattress might be what you want. Pocket or Marshall Coils are the latest offerings. They offer excellent noise reduction and motion isolation. Unfortunately, they are expensive and the least durable. Basically, this is the thickness of the spring. Gauge ranges from 12 (thickest) to 18 (thinnest). A thick gauge leads to a firm mattress. Vice versa is true. Innerspring mattresses have anywhere between 300 and 2000 coils depending on the size. More often than not, a higher coil count reflects better contourability, consistent support, and durability. This is an innerspring mattress from Signature Sleep- a part of Dorel Industries. It is available in 2 thicknesses; 8 and 10 inches and comes in 4 sizes; twin, full, queen, and king. What we are reviewing here is the twin, 8-inch bed. This model uses 480 15-gauge coils that have been individually pocketed to minimize motion transfer and noise. Among other things, this mattress promises a comfortable and uninterrupted sleep with minimal motion transfer. The Contour also aims at giving you enough support that may consequently lead to great pressure point relief. This mattress is an immediate sibling and probably an upgrade of the Signature Sleep Reversible innerspring mattress. The major difference between these 2 is that the Contour uses pocket coils. It might, therefore, perform better in terms of deadening motion and noise. In terms of competition, the Signature Sleep Contour has the upper hand in comparison to the Serta Futon– another reversible innerspring mattress from a giant brand but that has been plagued by issues of durability. When dealing with things like mattresses, it pays to dig a little bit deeper into its construction details. This will help you determine whether you are getting a real deal or a mattress that you’ll need to replace within no time. Now, the Contour has an impressive construction design that we wouldn’t expect to find at its price tag. This mattress’ comfort starts right from the very top. The cover is made from a cotton-polyester blend jacquard. Besides its attractive design that will really boost your bedroom’s aesthetics, this cover is also highly breathable. Thus, it might help in dissipating heat and preventing moisture build-up. Right beneath the cover is a fire-retardant layer that provides a heat barrier in case of a fire outbreak. This layer is made up of chemicals and it chars to shield the most flammable materials from being exposed to the fire. In addition to its main role, this barrier also offers you a comfortable embracing feel. It also adds some degree of protection from the springs. Now, not all homeowners prefer mattresses with this layer. This is because, besides its great role, it also exposes you to a pool of chemicals and odors that may have devastating effects in the long run. After the fire retardant barrier comes a 12 ILD medium density responsive memory foam layer. As its name alludes, this layer offers the initial hugging feel for comfort and support. Its medium firmness also minimizes sinkage and makes moving on the mattress easy. What’s even better, this thick foam also stiffens the edges of the mattress to create a larger sleeping surface. Right on top of the coil base is a 1.25’’ high-density foam layer that transitions you to the innerspring system. This layer’s high-density design gives the top layers an even feel. In addition, it deadens the sinking feeling that is commonplace with innerspring mattresses. The main layer of this mattress is a series of 480 individually pocketed 7-inch 15-gauge coils. The coil count and gauge of this base fall right within the ballparks that we recommend at sleepify.com. Basically, we advocate for a 460-500 coil count for a twin mattress and an 850-1050 for a queen bed. The 2 models should also have a 12-15 coil gauge for the right amount of support and conformity. A great feature about these coils is that they are individually wrapped in cloth pockets. The main idea here is to offer you excellent localized contour. Again, this technology also minimizes motion transfer besides keeping the squeaking noises at a minimum. Basically, this helps in curbing most of the downsides that plague innerspring mattresses; motion transfer, noise, and poor pressure relief. Without forgetting, the Signature Contour 8 uses tempered coils. Without making things complex, pocket coils are, in most cases, thin and non-tempered. As such, they have the least durability. Tempered steel coils are common with Bonnell and Offset models and are the most durable. 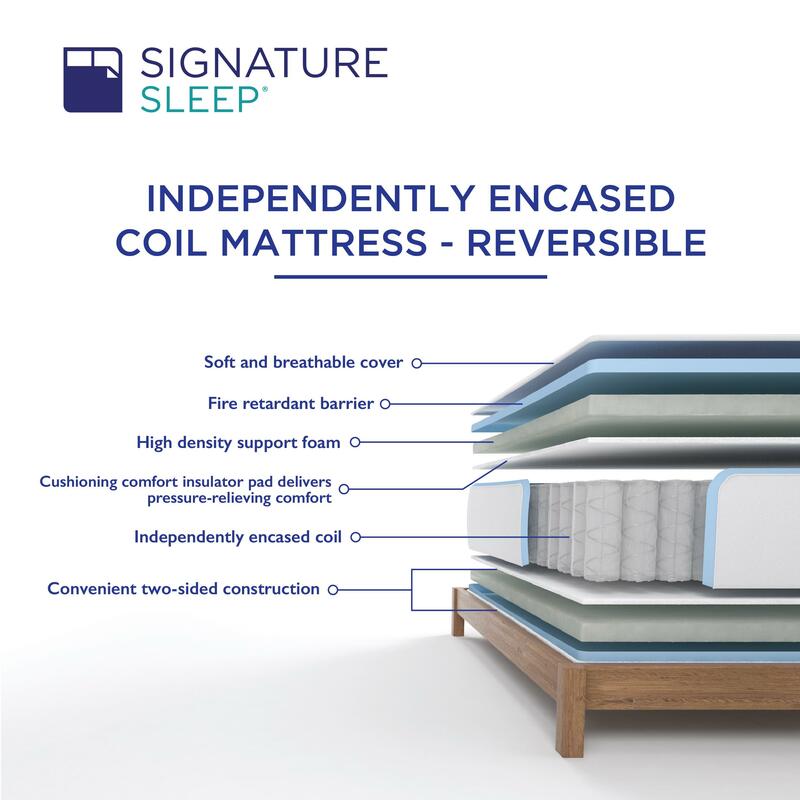 That’s why it’s quite exciting to realize that Signature goes off the grain to use these high-end coils in a mattress so affordable. One great feature that boosts the Contour 8’s popularity is the fact that it is reversible. What I mean here is that the opposite side has the same layers in the exact combination. I have to disclose here that mattress flipping isn’t common with regular innerspring mattresses. This is, in fact, the leading cause of their poor durability. Generally, flipping and rotating a mattress means that both sides experience even wearing and tearing. Besides prolonging its usable lifetime, it also means that you’ll be getting neutral support throughout. So, the Contour gets our two thumbs up on this aspect as well. This mattress has a medium firmness feel. While this is the most recommendable firmness for almost all sleeping styles, the Contour 8 tends to cater for back sleepers and stomach snoozers best. However, lightweight kids and teenagers who sleep on their side might find it comfortable as well. Considering its thin comfort layers, this mattress won’t be a wise choice for heavy adult side sleepers. Your most affected regions- shoulders and lumbar- might sink through and face stiff opposition from the high-density layer and coils. This is yet another front that the Contour 8 has been able to perform so well in comparison to others. This mattress uses several techniques to keep motion transfer to a minimum. To begin with, it features individually pocketed coils that localize motions and vibrations. It also has a high-density layer that further boosts this function. Well, I don’t actually mean that this mattress will beat the pants off memory foam and latex mattresses in this regard. It uses an innerspring base, remember? All in all, it’ll do quite a good job of minimizing disturbances provided your partner doesn’t kick like a camel. Professor Jim Horne of Loughborough University’s Sleep Research Centre also recommends adding the right sheets that will boost motion isolation. No. As most of its 8k+ buyers affirm, it’s very unlikely that this mattress will make you feel like you are on a treadmill. The Contour 8’s moisture-wicking cotton-polyester blend cover and the innerspring base help in dissipating the heat from your body. The 2 also promote excellent air transfer for a cool night. Consequently, this may lead to less turning and tossing thereby guaranteeing you a night full of rest. The Signature Sleep Contour has several layers of synthetic foams including a fire-retardant pad. Therefore, it’s pretty much likely that it will have a slight smell right out of the package. To give you some peace of mind, Signature Sleep uses Certipur-us certified synthetic materials in this mattress. This is a guarantee that the fumes from this mattress won’t subject you to phthalates and heavy metals. On the same note, the manufacturer advises you to let the mattress to air out in the open for 24-48 hours. Unfortunately, neither Signature Sleep nor Amazon allows you to test-drive this mattress at home. As such, it might be quite a shocker in case your body does not like it. If this really matters to you, eBay offers the best deal on this mattress. They will accept it back in 30 days either for a refund or an exchange. Click here to find out whether they still have it in stock. About the warranty, Signature Sleep offers a 1-year limited warranty. Honestly, this is quite poor considering its reputation. But we should also not expect too much from a mattress at its price. As it’s always the case, I had to scour around the internet to get a view from other buyers. Needless to mention, what I got was just in line with what I expected. Reading from the reviews section on Amazon, Walmart, and eBay, a good number of those who use it say that it is super comfortable. Most users point out that it is neither too hard nor too soft. Thus, it offers a superb amount of comfort and support at the same time. A good number of them also note that there is a slight odor when you pull it out from the package. But they also report that it is not overwhelming and that it dissipates fast after airing the mattress. Of course, I also did come across several complaints that the mattress sagged within a few months. So, we hope that the manufacturer honors their 1-year limited warranty on such issues. Anyone who is eyeing the Sleep Contour 8 is definitely looking for an affordable mattress, and the Classic Brands Engage offers yet another option. What we are looking at here is the Full-size model. But you could also get it in twin, twin xl, queen, king, and California king. The Classic Brands is a little bit different from the Signature Contour in that it uses a 6-inch coil system. On the other hand, it has a 3-inch thick comfort layer on top. Thus, it makes a good choice for all sleepers including heavy adult side snoozers. This mattress has a gel layer to dissipate heat and comes with a 10-year warranty. The Linenspa 6-inch mattress will make a great choice if you are buying it for a kid or a bunk bed. This is a typical innerspring mattress with a quilted foam cover and a thin supportive pad. Similar to the Contour 8, this mattress also has a fire retardant layer for the user’s safety. It uses tempered steel coils for durability and has a soft yet supportive feel for lightweight sleepers. Click here for more information about it. Swiss Ortho Sleep is not a new brand. Its 12-inch innerspring mattress is among the trending mattresses in this category. The major difference between this model and the Contour 8 is that the former uses 13-gauge 9-inch springs. This mattress features a 2-inch memory foam and a 1-inch wave foam pad atop the innerspring base. What’s even better is its bamboo-infused cover. It is not only highly breathable to offer you a cool night with minimal tossing and turning. But it also acts as a natural fire retardant layer. The Swiss Ortho uses certipur-us certified comfort components and also comes with a 10-year warranty. Learn more about it Here. I wouldn’t call the Signature Sleep Contour the best innerspring mattress on the planet. However, it makes a really good choice if you are looking for an affordable bed that will give you good value for your money. This mattress’ medium-density feel promises a soft yet supportive bed that might help in relieving pressure points and back pains. It’s also impressive that it accommodates different sleepers including lightweight side snoozers. It has a superb construction design for durability and also features a fire retardant pad for your family’s safety. But the best part about it is that it is reversible. This not only promises excellent durability. But it also promotes a consistent feel for years. It’s 30-day trial period (on select online retailers) and 1-year limited warranty is a blow to its seemingly good quality. But its thousands of positive feedbacks from past buyers and quality of materials suggest that it might make a good purchase.